Kalyanapuram R. Aaravamudachariar, born in 1936 is the senior most exponent of HARIKATHA, a composite art which is incorporated with classical music, literature, moral and spiritual values etc. After a 20-year corporate career, he gave it up in 1983 to follow his heart; he resigned and accepted the calling of Harikatha for life. Devoting himself assiduously to mastery of Harikatha, he learned the sampradaya granthas from Srimath Thirukudanthai Andavan. He learned the intricacies of Harikatha and music from Embar Vijayaraghavachariar. His maiden public Harikatha performance was at the Music Academy in 1979. He has since given many performances there and elsewhere. Over the years, his reputation has kept pace with his formidable talents, skills and scholarship. His performances attract huge audience, who are kept spellbound by his scintillating and soul-stirring music. He is a TOP GRADE artist of All India Radio and Doordarshan. 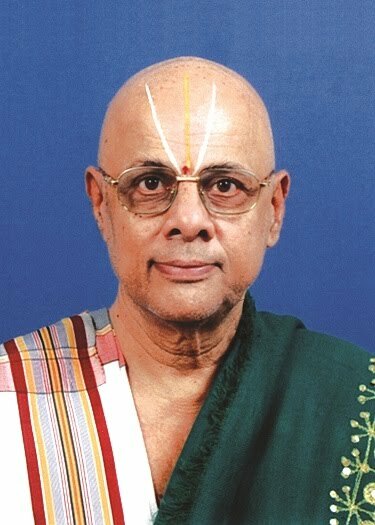 He is the Asthana Vidwan of Srirangam Srimath Andavan Asramam. In recognition of his mastery of this art, Sangeet Natak Akademy, New Delhi selected him for SNA Award for the year 2006, which was presented by the then President of India, Dr. APJ Abdul Kalam in February 2007. Similarly, appreciating his distinction in this art, Tamilnadu Government conferred on him KALAIMAMANI award in 1995. 1. TTK Award presented by the Madras Music Academy in the year 2002. 2. SANGEETHA KALASIKHAMANI Award presented by the Indian Fine Arts Society, Chennai in 2004. 3. MADURA KALA PRAVEENA Award presented by Sri Sathguru Sangeetha Samajam, Madurai in 2007. 4. SANGEETHA KALA NIPUNA Award presented by the Mylapore Fine Arts Society, Chennai in 2009. 5. ARUNKALAI MAMANI Award presented by Pollachi Tamil Isai Sangam in 2010. 6. HARIKATHA CHOODAMANI Award presented by Sri Krishna Gana Sabha, Chennai, in 2011. 7. GNANA CHEMMAL Award presented by Sri Krishna Sweets, Coimbatore in 2011. 8. LIFETIME ACHIEVEMENT AWARD presented by Kartik Fine Arts, Chennai in 2013. 9. SANGEETHA UPANYASAKA Award presented by Ram Endowments, Chennai in 2014. Besides the above, Sri Aaravamudachariar has received several other titles such as HARIKATHA PRAVACHAANA PRAVEENA, SANGEETHA UPANYASA TILAKAM, SANGEETHA SATHKATHA SARVABOWMA HARIKATHA, RATHNAM, HARIKATHA VACHASPATI, HARIKATHA SUDHANIDHI, BHAGAVATAKULA DIWAKARA etc. Kalyanapuram R. Aaravamudachariar has special interest in inculcating in the minds of youngsters the value systems and in order to achieve this objective, he founded a non-profit service academy called SHREYAS in 2003 to propagate the moral and spiritual values deep-rooted in our culture/sanadhana dharma. He also visits Senior Citizen Homes and performs Harikatha exclusively for them, thus making them happy. In short, Kalyanapuram R. Aaravamudachariar's name is well known to the art-lovers, as he is able to entertain both laymen and connoisseurs by his mellifluous music and scholarly discourse.